What do a music legend and a supermodel have in common? Other than celebrity status, how about a Houston Astros sweater jacket with rainbow stripes? 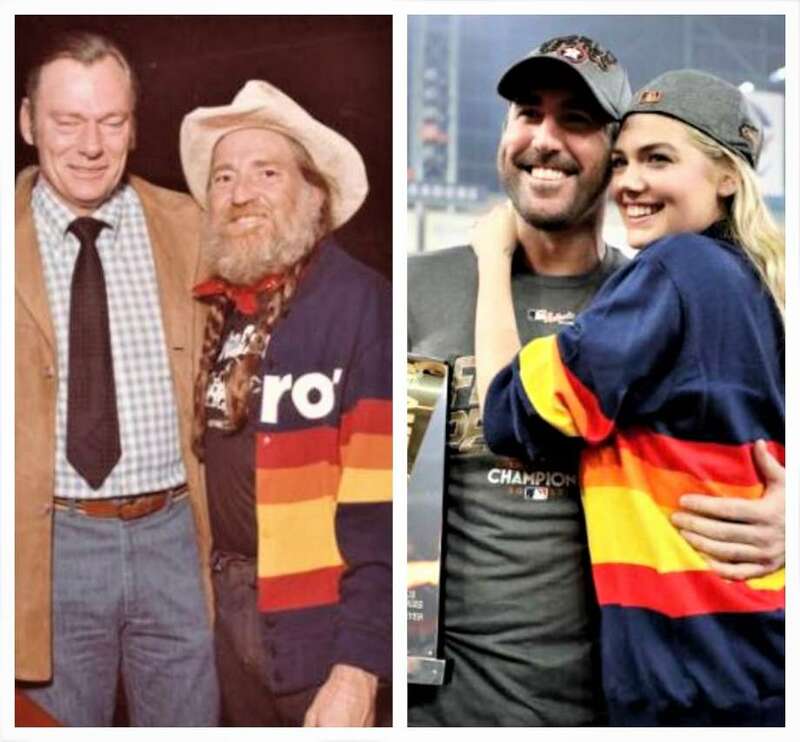 That’s the case with two of the ‘Stros famous fans: supermodel Kate Upton and country icon Willie Nelson. The retro Astros rainbow sweater jacket flew off the shelves when Upton, who is married to Astros pitcher Justin Verlander, wore it to Game 7 of the 2017 American League Championship Series, and again to Game 6 of the Justin Verlander, wore it to Game 7 of the 2017 American League Championship Series, and again to Game 6 of the 2017 World Series. But it was 85-year-old country icon Willie Nelson who first wore the colorful clothing item. Willie’s affinity for eye-catching knitted garments includes a red and green marijuana-themed sweater with “smoke weed everyday” printed in white letters gifted to Nelson by Snoop Dogg. In the autographed photo at top, Nelson is pictured donning the old-school jacket while standing next to Southwest Airlines founder and former CEO Herb Kelleher, who was chief executive officer of the company from 1982 to 2001. Local TV station KPRC reached out to Southwest Airlines for more background on the image, and while the archivist for the Dallas-based airline was able to share that the photo was taken between the 1970s and early 1980s, no other information was available. If you’ve got the money, honey you can score Upton’s $200 Astros sweater jacket, by Philadelphia-based Mitchell and Ness Nostalgic Co., but you’ll have to act fast as the coveted garb will sale out quickly. You can get yours at the Astros team store at Minute Maid Park, which has a limited supply, at R&A Sports in Conroe, which has two boxes of the sweater in size large only, or online at Mitchell and Ness, which has around 100 left in stock. If you miss out, there’s always a Nolan Ryan 1980 authentic jersey, available online at Mitchell and Ness for $300. This entry was posted on Monday, October 15th, 2018 at 8:57 pm and is filed under Clothing. You can follow any responses to this entry through the RSS 2.0 feed. You can leave a response, or trackback from your own site.